After the legal affairs committee (JURI) of the European Parliament rubberstamped, with a solid but unsurprising 16-9 majority, an interinstitutional agreement on the EU Copyright Directive, it became known that the decisive plenary vote will be held the last week of March. That same day (Tuesday), Germany's Federal Commissioner for Data Protection and Freedom of Information, Ulrich Kelber, issued a statement highlighting the risk of a further concentration of data traffic among a few large Internet companies as a result of a de facto requirement for upload filters. Also in recent days, a rap video in which some YouTubers vent their frustration over the bill and "diss" (= insult in rap terms) the Parliament's rapporteur, Axel Voss MEP (from Merkel's party), has been viewed more than 400,000 times, but what's needed to prevent the Article 13 disaster is plenary votes, not YouTube clicks. Of course, voters can indirectly influence the Parliament. Demonstrations will take place in many (mostly Central European) cities on March 23 (the Saturday before the vote). 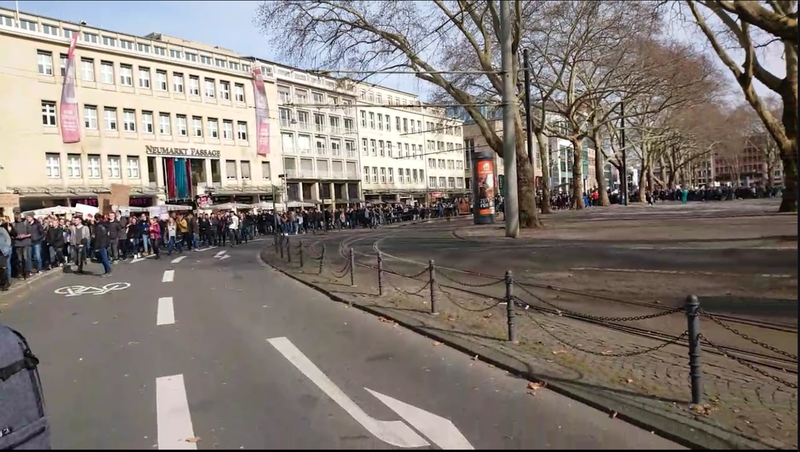 However, it would take huge numbers of protesters (and preferably not only in Germany) to influence the outcome. I visited the Facebook event pages where people can declare their intent or interest to participate, and for each of the cities I looked at, the number of people who announced they would come was in the hundreds. However, thousands of mostly young people took to the streets of Cologne last Saturday, and that demonstration had been announced only three days before. So there still is a potential for many people showing up on the 23rd. One of the efforts to get MEPs to vote against Article 13 is the Pledge2019.eu website, where MEPs can promise to vote accordingly. As of this morning, 62 MEPs (out of 751) had made the pledge. This, too, is not a bad number after only a few days. But ultimately the question of whether Article 13 will or will not be passed into law is a matter of numbers, so I wanted to analyze the Pledge2019 results and generally take a closer look at the vote the Parliament held in September 2018 on Axel Voss MEP's negotiating mandate. A spreadsheet with key voting results from September 2018 is available on Google Docs. I downloaded the document and performed some further analysis. It's important to bear the procedural stage in mind. In September, it wasn't yet about enacting a law, but about a negotiating mandate--but obviously the question was on what basis the Parliament would negotiate with the other institutions (Council and Commission). The mandate per received a massive 440-225 majority. And the majority against the deletion of Article 13 was even more overwhelming: 510-167. But that's only part of the story. The vote was substantially closer (though still not what I'd call a "narrow" outcome in a strict sense) on two alternative versions of Article 13. Mr. Voss's version was approved by 365-300, while Julia Reda MEP (a Pirate Party MEP, vice chair of the Greens-European Free Alliance group in the Parliament, and the leader of the resistance movement) received only 278 votes for what would have been her (in my words) "lesser evil" version of the article--and 390 MEPs voted against said lesser evil. What hardly anybody (only 3 MEPs) did was to support Mr. Voss's version of Article 13, but to prefer the deletion of the entire article. Those who voted for Mr. Voss's proposal also wanted that one to become law. Also, out of the 365 MEPs who voted for Mr. Voss's version of Article 13, 351 also supported his negotiating mandate. This, again, shows that his supporters were determined to achieve a certain outcome. Another number that proves this point is that 370 MEPs opposed Mrs. Reda's attenuated version of the article and equally opposed deletion. In late March, the proposal to delete Article 13 will be key, and there's no doubt it will get far more votes than the 167 from September. The starting point will then actually be who voted against Mr. Voss's text (as I wrote above, 300 MEPs). Another number underpins this theory: 121 MEPs voted in favor Mrs. Reda's version, yet opposed deletion of the article at that procedural stage. Most of them will likely support deletion next time. Still, the key question is: how can we close the gap between 300 (the number of MEPs who opposed Mr. Voss's text; the trilogue outcome is different, but arguably worse) and 365 (the number of MEPs who voted for Mr. Voss's version). The problem this time around is that the proponents of the bill will argue that a provisional interinstitutional agreement should be rubberstamped, and they'll point to various carveouts, too. But concerns over Article 13 will be taken more seriously, and the statement by German's chief data privacy official (mentioned further above) is an example of what may lead many MEPs to have second thoughts. With all of that in mind, let's now look at whether Pledge2019 shows some momentum toward rejection. There's definitely a glimmer of hope, but it will be a Herculean task in March to turn this around. The above document is sorted by political group first (starting with the right wing and moving down toward the left, where there's traditionally been strong support for the anti-Article 13 cause), country second, last name third. The really big wins are those MEPs who have two yellow fields: they voted against the deletion of Article 13, but for Mr. Voss's negotiating mandate, in September, and now they're definitely opposed to Article 13. Those big wins have mostly been scored in Austria so far, but a prominent German Green MEP (former Green party chairman Reinhard Buetikofer) is another example. What's also positive, though not a major breakthrough, is when MEPs who already voted against the negotiating mandate in September, but not for the deletion of Article 13 at the time, are now in favor of deletion. If we can't even get their support, we're totally lost because only a minority supported deletion per se in September. It's not surprising that MEPs who voted against the negotiating mandate in September largely preferred Mrs. Reda's version of Article 13 over Mr. Voss's proposal. A lot can happen in one month, and we can still defeat Article 13. Pledge2019 shows progress toward that goal, but there's still a high risk of all that progress being "too little, too late" come the late-March vote. What has me profoundly concerned is that Pledge2019 reflects headway in only some countries, and almost exclusively on the left wing. The largest group in the Parliament is the European People's Party. In order to win, one needs at least some significant traction with their MEPs. Mr. Voss is an EPP MEP, so it's going to be hard to persuade his colleagues to go against the Parliament's rapporteur and chief negotiator. But it is possible. Wht makes the late-March vote particularly hard to predict is that this is an election year. The number of absentees is always relatively high when the Parliament votes, but this time around--the copyright vote will be just two months before EP elections--it's likely going to be even higher (though it depends on the exact day). What we might be able to achieve is that a significant number of EPP MEPs would, instead of openly opposing Mr. Voss, simply stay away on the day of the day of the copyright vote. They can always blame it on the election campaign. If we dissuaded, for instance, 30 EPP MEPs from participating in the vote though they normally would attend and support Mr. Voss, and if we then firmed up our support among some other parties along the lines of what has happened with some Austrian center-left MEPs and the aforementioned German Green MEP, then we could score a narrow victory! Would I bet money on a positive outcome today? To be honest, I wouldn't yet. The risk is still very high. But if there's significant headway every single week of March, then a turnaround is achievable. Huawei and Samsung just filed a joint motion to stay the appellate proceedings before the Federal Circuit relating to Samsung's antisuit injunction. The reason for the request for a stay (at a stage where everything but the appellate decision had happened already) is that they entered into a settlement agreement yesterday. "Appellants Huawei Technologies Co., Ltd., Huawei Device USA, Inc., and Huawei Technologies USA, Inc. (collectively, 'Huawei'), and Appellees Samsung Electronics Co., Ltd., Samsung Electronics America, Inc., and Samsung Research America, Inc. (collectively, 'Samsung'), hereby move this Court, pursuant to Federal Rule of Appellate Procedure 27, for a 30-day stay of this appeal. On February 25, 2019, the parties entered into a settlement agreement and, pursuant to that agreement, they anticipate that in the next several weeks they will complete the pending steps to finalize the settlement and ultimately that Huawei will file an unopposed motion to dismiss this pending appeal within the next 30 days." The U.S. case, filed back in 2016, would have gone to trial in September--and the jury would have heard Samsung's allegations of Huawei having breached its FRAND licensing obligations. Many infringement cases were brought by Huawei in China, and Samsung retaliated there as well. This was the most important--in fact, the only important--dispute ever involving two Android device makers. As always, I congratulate both parties on freeing up resources this way! To skip to said translation of the statement, please click here. In my previous post I reported and commented on the two-thirds majority of the members of the European Parliament's legal affairs committee (JURI) that voted in favor of the proposed EU Copyright Directive and announced at the end that I was going to translate--in the post you now have in front of you--a statement that came out just before the JURI vote and may help with a view to the European Parliament's plenary vote as well as the further process, provided there is a further process, which requires the Parliament to reject or amend the directive. The Federal Data Protection Commissioner of Germany, Ulrich Kelber, issued a statement voicing his concerns about the most problematic element of the bill in its current form: upload filters. The bill doesn't mention them explicitly, but simply makes them a de facto requirement, and Mr. Kelber's statement (in German; I'll translate the full text below) addresses the ramifications of upload filters for data protection. This translation, which was furnished by Florian Mueller (fosspatents.com), has been approved as correct by the Federal Commissioner for Data Protection and Freedom of Information. Feel free to disseminate, but please do include this notice. The copyright reform package that is currently being discussed in Brussels could also pose significant risks relating to data privacy rights. Above all, the use of so-called upload filters presents a threat of a few large providers of such technology gathering even more data concerning the users of many Internet platforms and services. With its present copyright bill, the EU is seeking, among other goals, to strengthen the position of creators enforcing their rights against commercial Internet platforms such as YouTube. The objective is to establish liability for platform operators failing to take measures to prevent the illegal distribution of copyrighted works via their services. 16-9, or 64% v. 36%, does mean that, for the time being, everything has worked out just the way the proponents of the directive and Article 13 ("upload filters") wanted. But it does not make it a foregone conclusion that the plenary vote in late March or mid April will also result in a rubberstamping of the proposal. In 2005, the same committee that voted for the copyright bill today (JURI) took a position on the software patent directive that was pretty much the opposite of what I wanted. But a then came the plenary vote, and an overwhelming majority (it was actually close to unanimity) threw out the bill, following a procedural agreement. That, too, was a legislative process involving IP, and a committee like JURI traditionally attracts many members with an unbalanced pro-IP perspective. That's not even a specifically European problem, but let's not digress into the situation in certain IP subcommittees on the other side of the pond. In 2007. it was about soccer broadcasting rights, and delays on my client's side prevented me from taking action at the committee stage. Four committees had voted, with three taking extremely unbalanced positions, and in that case JURI was actually pretty unharmful because their position was more of a summary of the case law than a statement of political demands. The lead committee at the time was CULT (culture and education), which is even less balanced than JURI, just in the opposite direction (what both have in common is a lack of economic realism). Irrespectively of the situation in those committees, together with allies in the Parliament (British Tories, Spanish Partido Popular, UKIP) I built a majority for an amendment that kicked out an item from a resolution just the way the opponents of upload filters should now get Article 13 stricken. So I'm speaking from successful experience as opposed to exhorting people to hold out as a matter of principle. Today is not a setback. In fact, a 55%-45% approval of the bill would already have been a surprise, like an upset victory (though technically it would have been a defeat), just because of JURI's unique composition that is not representative of the plenary. Shortly before the JURI vote, something positive happened in Germany, and in my next post I'll translate a statement by Germany's Federal Data Protection Commissioner that could prove quite helpful in the build-up to the European Parliament's plenary vote as well as the further process (if it isn't "game over" after the next vote), where the German government would again have the opportunity to oppose Article 13, i.e., upload filters. In a high-stakes case over tens of billions of dollars, where the late "processing" charge alone accounts for more than $1.3 billion, you obviously would want to bring in the best--and only the best--in order to maximize your chances to win. But case no. 3-17-cv1375 in the Southern District of California never was a high-profile case, and by now it is, at first sight, just a nuisance lawsuit. There was the aforementioned ruling that limits the potential for damages, and there was a summary judgment that Apple doesn't infringe a patent from the same Qualcomm patent family as the one that gave rise to an agnostic injunction in Munich. Also, the way things have gone in the ITC case to which Qualcomm's 17cv1375 lawsuit was just a companion complaint for the purpose of seeking damages (which the ITC can't award) doesn't suggest there's much that can come out of it. The only patent that an ITC judge held infringed (only a preliminary finding that may or may not be overturned) has been worked around already by means of an iOS update. Tiny damages in play; one patent thrown out; five (including the one I just mentioned) already failed in the ITC; and the only one that's still in play at the ITC has been worked around. The combination of those circumstances would normally make it highly counterintuitive that a litigant--Qualcomm in this case--would throw a huge amount of good money after bad. So why is Qualcomm doing this? Qualcomm will presumably appeal some or all unfavorable parts of the ITC decision to the Federal Circuit. Technically Qualcomm could already have done so with respect to the two patents that the Commission (the six-member decision-making body at the top of the U.S. trade agency) threw out by denying Qualcomm's petition for a review. Mrs. Sullivan has been lead counsel of major companies in various other appeals of ITC decisions. Here, with the district court looking at some of the same issues, she may want to ensure that Qualcomm's arguments in one forum don't weaken its position in the other. Should Mrs. Sullivan's job in the small-damages case in San Diego be about more than just ensuring consistency with the upcoming ITC appeal, then it could be that Qualcomm feels so much pressure to prevail over Apple that it affords such a high-profile attorney even if the potential short-term gains (damages) fall far short of making this a rational choice. Qualcomm's offensive case will go to trial next Monday (March 4), and on July 15, Apple's offensive counterclaims (over various patents that Apple claims are infringed by Qualcomm) will go to trial. To be honest, I haven't analyzed the strength of Apple's offensive claims; too early for that. Therefore, I can't rule out that Qualcomm's apparently strong interest in the 17cv1375 case is, to whatever degree, due to fears of Apple possibly being more successful with its counterclaims than Qualcomm with its own claims. Over the years I've heard a number of oral recordings of appellate arguments by Mrs. Sullivan. The most notable achievement in those cases was the Supreme Court ruling on design patent damages (while the ultimate outcome in Apple v. Samsung wasn't a whole lot better on remand, future defendants against design patents will be in a significantly stronger position, provided that they learn from that case). On Google's (technically, Motorola Mobility's) behalf she lost the FRAND appeal against Microsoft, but Google changed its stance on standard-essential patents (SEPs), so from today's perspective Google is probably happy how that case worked out. I did, however, also notice two things that suggest to me she may just be taking on too many cases at times, with many QE clients presumably asking her to represent them. In one case (I believe it was an Apple v. Motorola ITC appeal), Orrick's Joshua Rosenkranz appeared to know the specifics of the case better. And in some Apple-Samsung appeal unrelated to design patents, another QE lawyer made her aware of having gotten carried away: she was talking about a somewhat similar issue in an unrelated case she was working on at the same time. The further proceedings in the San Diego case, as well as the future ITC appeal, may shed some light on why Qualcomm would bring in a legal superstar for a case that appeared to be just a nuisance lawsuit. The real showdown between Apple and Qualcomm will take place in San Diego starting April 15, with Apple stressing antitrust, FRAND and patent exhaustion arguments while Qualcomm seeks to emphasize various contracts it used to have or still has in place with Apple and its four contract manufacturers. But in addition to that one, infringement cases are pending in multiple jurisdictions (U.S., Germany, China) because Qualcomm hoped to gain leverage over Apple ahead of the San Diego trial. False hopes, as we know by now. Today the Mannheim Regional Court (in German: Landgericht Mannheim) ordered a stay of the case in which Qualcomm is asserting the German part of its European patent EP3036768 on a "layout construction for addressing electromigration" against Apple. The infringement proceedings are stayed until a decision by the Federal Patent Court of Germany on Apple and Intel's nullity complaint (or any alternative resolution of the validity action). In their efforts to get that Qualcomm patent invalidated, Apple and Intel are represented by patent attorneys from Samson & Partner, for whom this order to stay the case is a victory, at least for the time being--as it is for defendants' lead counsel in this litigation, Hoyng Rokh Monegier's Klaus Haft. At the October trial (see my report), Presiding Judge Dr. Holger Kircher had already suggested that counsel for Qualcomm stipulate to a stay, given that Qualcomm was seeking to differentiate its amended claim (after the original claim turned out to be indefensible) through a claim limitation devoid of any technical substance. They added a chip layout element that has nothing whatsoever to do with the stated goal of the patent, which is to reduce electromigration. Four months earlier, Quinn Emanuel's Dr. Marcus Grosch had stipulated to a stay of another Mannheim case, but declined to do so again. It's very unusual for the Mannheim court to make a decision well over four months (actually, almost five) after a trial. However, in this case the reason was that the court had serious doubts about the validity of this patent anyway, but rather than stay the case immediately, the court wanted to give the parties more time so that further progress in the parallel nullity action could be made. In German infringement proceedings, the courts deciding on the infringement complaint estimate the chances of a parallel nullity action. In this case, the presiding judge had expressed hopes (at trial time) that Qualcomm might stipulate to a stay a little bit later, but if Qualcomm had done so, the court wouldn't have had to announce a decision today. Qualcomm's first six patent assertions against Apple in Germany (technically nine, but four of those patents are from the same family) have been a failure. Two of the three Mannheim cases got stayed, and one got thrown out in January due to non-infringement. In Munich, one case got thrown out, one resulted in an agnostic ruling that Apple has worked around at Intel's expense, which in turn raises antitrust issues, and the set of Munich cases involving those four patents from one family has been dismissed in part, with the rest likely being stayed soon (and in any event, iOS 12 contains a workaround). With this kind of a track record, it's easy to understand, but rationally impossible to support, Qualcomm's preference for royalty determinations by courts or arbitration tribunals that would be based just on the number of patents the chipmaker holds as opposed to actual findings that valid patents are infringed and not exhausted (and can't be easily worked around). At least four more German patent assertions by Qualcomm against Apple are pending. The Munich I Regional Court will hold a first hearing next month in an antenna patent case. Mannheim trials in three other cases have been scheduled for May 28, July 9, and October 8. On April 15, the Apple & contract manufacturers v. Qualcomm trial will start in San Diego (Southern District of California), and the stakes are high. This is a key month for pretrial filings. I've gleaned from the parties' joint pretrial brief on disputed contract terms that Qualcomm charges a 5% patent royalty on iPhone repairs performed by Foxconn and wants an extra $1.3 billion from three of Apple's four contract manufacturers as a late "processing and handling" charge. Beyond the joint pretrial brief, the parties have also filed literally dozens of motions, and yesterday (Saturday) they filed a total of more than 1,100 pages (!) relating to, and including, their proposed jury instructions and verdict forms. It's obviously impossible to discuss everything in detail. The purpose of this post is to provide a bird's-eye view of the parties' priorities in the upcoming trial. Those priorities are reflected by what Apple writes about its plans for its case-in-chief, by what the parties would like to go into or be kept out of the jury instructions, and by their preferences for the order of items on the jury form as well as what should be put before a jury in the first place (as opposed to being decided by the judge). The most fundamental difference is that Apple and its contract manufacturers place the emphasis on antitrust claims and FRAND licensing issues, while Qualcomm would like to focus the judge and the jury primarily on the contracts it has, or used to have, in place with the parties. In legal Latin, one could sum up Qualcomm's mantra as "pacta sunt servanda" (contracts must be fulfilled). I don't remember seeing that phrase in those documents, but that's the philosophy. While this sounds clear and logical, it's actually not that simple when antitrust issues come into play. Antitrust law always trumps contract law, provided that there is an antitrust violation. The freedom of parties to define contract terms freely is important. Even very important. But it's not absolute. Contract terms can be unenforceable as a matter of contract law, or due to other laws, such as competition laws. That's why professionally-written contracts almost always come with a salving clause that states what to do if a court of law holds one or more clauses of a contract invalid or unenforceable. If "pacta sunt servanda" was a self-sufficient answer, a salving clause wouldn't be needed because everything would be valid and enforceable. Not only can clauses be held invalid or unenforceable but there can also be restrictions based on, for instance, reasonableness principles. Apple has now announced in its position statement that it will begin its case-in-chief (which will be the first case-in-chief since Apple brought the original complaint) with antitrust and FRAND matters. There's nothing Qualcomm can do about that. But Qualcomm would at least like to structure the jury instructions and proposed verdict form in a way that downplays the importance of antitrust and FRAND claims, and draws the jury's attention primarily to the contract terms Qualcomm imposed on the plaintiffs (and some of which Qualcomm says have been breached). The importance of psychological considerations is underscored by Apple objecting to Qualcomm's proposals that always list Qualcomm first when the jury, on the verdict form, has to find whom it found for. Apple says as plaintiff it should come first. While such details can also make a difference, there are some more substantive disagreements. lists affirmative defenses that Qualcomm believes should not be put before the jury. Qualcomm generally seeks to minimize what the jury will be told. Affirmative defenses are a key part of that, but it goes beyond. Apple would even like the jury to take advisory positions on certain matters to be decided by the court, which Qualcomm opposes. Typically, such disagreements are always just about how a party believes the jury will view the parties' conduct (good guys vs. bad guys) if it hears about certain defenses and claims. In another California FRAND case, Huawei unsuccessfully sought to avoid that Samsung could present its FRAND breach case to a San Francisco jury next September. And one of the ways in which Judge Alsup (who's not involved with the Apple-Qualcomm dispute) disadvantaged Oracle against Google was that he allowed Google to raise open-source arguments that jurors apparently conflated with the actual "fair use" factors. Back to Apple-Qualcomm, it appears that Qualcomm simply wants the focus to be on what the contract say, and anything that calls the language of the contracts into question or limits its relevance is undesirable from Qualcomm's view, be it an antitrust issue, FRAND licensing obligations, or affirmative defenses. In one of its numerous motions in limine, Qualcomm doesn't want Apple to refer to chipset-level licensing (smallest salable patent-practicing unit). That's the most interesting issue in FTC v. Qualcomm. It's also key to Apple & contract manufacturers v. Qualcomm because nothing has a greater potential impact on a FRAND determination than the identification of the royalty base. Another question is almost as important as the parties' disagreement on whether the case is primarily about antitrust and FRAND or about contracts: the question of whether it's a patent case to some degree. It's not a patent infringement case in a strict sense as Qualcomm, in its efforts to avoid an exhaustion finding, waived its rights related to various patents and got some declaratory-judgment claims thrown out by the court. Qualcomm's "exhaustophobia" is quite extreme. Therefore, Qualcomm also brought a motion in limine regarding any references to patent exhaustion, and more generally, it just doesn't want Apple to dispute that Qualcomm's patents are valid and infringed. In other words, Qualcomm wants to tell the San Diego jury in the Apple case, as it told Judge Koh last month in the FTC case, that it owns 130K patents and believes those are worth a 5% royalty (3.25% for standard-essential patents and 1.75% for non-SEPs). But as I wrote ten days ago, Qualcomm's infringement lawsuits against Apple haven't really delivered results, after almost two years, that support Qualcomm's royalty demands. Many of those patent assertions have been unsuccessful (obviously, at this stage everything can still be appealed), and even the ones that have succeeded have just resulted in injunctions that could be worked around (one of which is based on an agnostic ruling that is contradicted by two facts-based U.S. decisions involving a patent from the same patent family). Whether it's about Qualcomm's portfolio or anyone else's, it just doesn't make sense to assume that an entire portfolio consists of valid and infringed patents when discussing reasonable royalties. But Qualcomm argues it owns so many patents that it could just enter into a Super Sack non-assertion covenant with respect to some patents Apple sought to challenge in the San Diego case, just to get rid of the related declaratory-judgment claims. Qualcomm is not the only one to seek royalties based on portfolio size rather than actual proof of an infringement of valid patents. However, so far no one has gone as far as Qualcomm has in its efforts to avoid any determination on the merits sought by the other party. Just like in that Munich case in which an apparently non-infringing Qorvo chip was successfull accused by Qualcomm by preventing the court from analyzing the hard facts, Qualcomm favors agnosticism (in this case, with respect to whether the patents in its portfolio are valid, infringed, and not exhausted) over analysis. There are obviously reasons why the parties had to file north of 1,000 pages on a Saturday just to tell Judge Gonzalo P. Curiel about their disagreements on jury instructions and the verdict form. However, they may still be able to narrow the issues the court must rule on. They explained that they made the filings yesterday to meet the deadline, but efforts are continuing to reach an agreement on at least some questions. That is another reason for which I believe this is not the time to go into too much detail on those filings. For now, what's key is to know the countours of the clash. Toward the end of an eventful week on the EU copyright reform front, during which the EU Commission was forced to apologize for calling dissidents a "mob" and the most controversial part of the bill--Article 13--almost got blocked in the EU Council, it's clear that the only EU institution that can still prevent a digital disaster is the European Parliament. But I'm increasingly hopeful as there are ever more signs of the people showing their elected representatives that it would be unwise for them to approve the most controversial piece of Internet legislation in history--and to do so shortly (less than two months) before European Parliament elections. The Commission at least apologized for inappropriate language. I'm still waiting for the Christian Democratic Union (CDU) of Germany--Merkel's party--to apologize for incorrectly attributing to "bots" the genuine outrage of countless humans of flesh and blood. Those people have voting rights or will reach that age soon, and Merkel's party risks making itself extremely unpopular among an entire generation of voters. 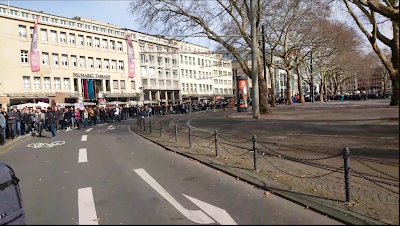 I'm writing this post as I'm watching a livestream of today's anti-Article 13 demonstration in Cologne, Germany. Thousands of mostly young people--at least twice as many as a week ago, despite the demonstration having been announced only three days (!) 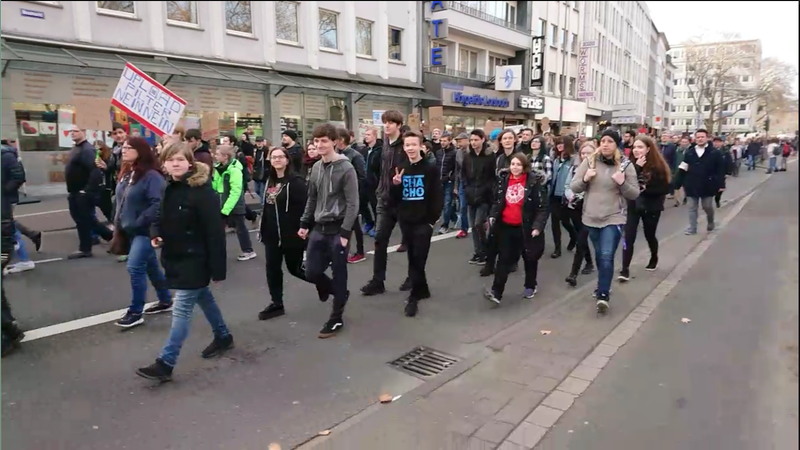 ago--are taking to the streets of Cologne as speak, and just the livestream I'm watching has more than 10K viewers at the moment (and it's not even the only one--all streams combined had more than 30K viewers). It's arrogant and ignorant at the same time to argue that those protesters don't understand the issue or that they allowed themselves to be used by Facebook and Google. This is a grassroots movement no matter what the proponents of the most stupid EU bill in a long time may claim. The Merkel-party MEP who's pushing for this bill to be adopted by the European Parliament, Axel Voss, needs a lesson in basic copyright law. He argued that most social networks wouldn't fall under Article 13 because it takes a substantial quantity of copyrighted material to be uploaded--but any profile picture is copyrightable, and, in fact, most Facebook or Twitter posts meet the (low, for good reasons) threshold for copyrightability. Either Mr. Voss is the most incompetent MEP ever to have been the Parliament's chief negotiator or he's extremely dishonest and seeks to mislead his colleagues in the Parliament, the media, and the general public against better knowledge. Pick whichever one of the two explanations you prefer. Either one is a disgrace for European democracy. 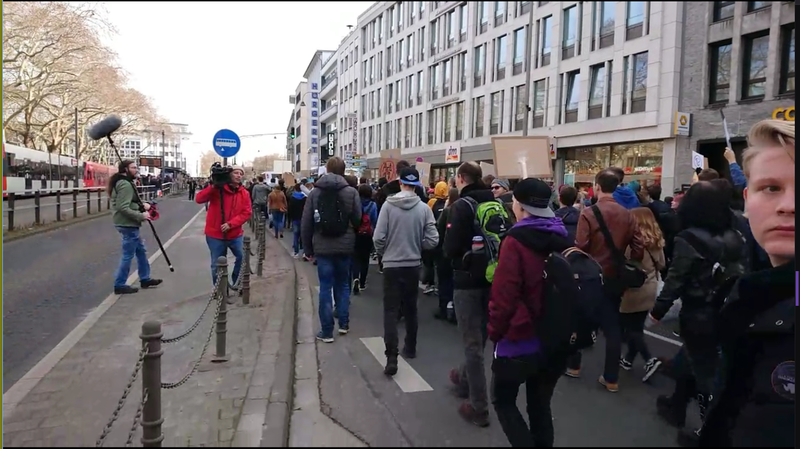 At the final rally, one of the organizers said the most offensive thing was that politicians like Mr. Voss claim the movement opposing Article 13 was in the pocket of large American corporations. The speaker said that's absolutely untrue: they're young people concerned about what the bill would do to the Internet, and there's no company behind them. There's tremendous momentum behind these protests, and the biggest demonstration is planned to take place in Berlin on March 23. Resistance to Article 13 is particularly visible in Germany, but next month there will be demonstrations in many European countries. Qualcomm's collection of a 5% patent royalty on iPhone repairs performed by Foxconn is not the only absurdity that Apple, its contract manufacturers and Qualcomm's joint pretrial brief revealed last week. How about a potentially record-setting administrative charge of more than $1.3 billion for the "processing and handling" of late payments? "Qualcomm agreed these late charges were 'administrative' to 'defray' 'costs in processing and handling.' Thus, the intent and scope of the provision expressly excludes compensating for any time-value of money and disclaims using fees to encourage (or coerce) timely performance. What Qualcomm is charging here is colloquially called "interest on interest" related to the contract manufacturer's cessation of royalty payments on the products they make for Apple in the spring of 2017. We know Qualcomm recently claimed that $7 billion in royalties that Qualcomm wants have not been paid. Apple and its contract manufacturers claim that they actually overpaid in the past because Qualcomm extracted supra-FRAND royalties. But even if we assumed, just for the sake of the argument, that Qualcomm had indeed been owed another $7 billion since the spring of 2017, a $1.3 billion surcharge on a $7 billion amount is huge. It's almost 20% of the amount allegedly owed! It's obviously not the kind of amount that Qualcomm could realistically claim it incurred in administrative costs. Processing a few royalty payments that come in late is not a lot of work. If that truly resulted in a billion-dollar cost, Qualcomm would be the most expensive bureaucracy in the world, and couldn't exist because, in that case, any employee's travel expense report would also cost a billion or so to process. The effect of "interest on interest" is huge if new interest is added every month. And if this dispute, including appeals, took several more years, then the ultimate claim on that basis would dwarf the current demand of more than $1.3 billion. Including the potential of treble damages, the Apple & contract manufacturers v. Qualcomm trial will roughly be about either side seeking approximately $30 billion from the other, the differential between the two extreme scenarios therefore being on the order of $60 billion. That's the proverbial high-stakes trial, and relative to that amount, the $1.3 billion late "processing and handling" charge is just a limited part of the overall dispute. However, just like those patent royalties charged on iPhone repairs (which probably represent a very small amount of the overall royalty demand), it's the utter unreasonableness of the underlying "logic" that is so striking here. The biggest problem with that unreasonableness is not that Qualcomm wants this. The problem is that Qualcomm has been able to impose contract terms that it can interpret that way in the first place. Those terms are very unusual, and that's also what we heard last month at the FTC v. Qualcomm antitrust trial. Of course, Qualcomm can and does pay expert witnesses who testify that such terms and conditions are simply a "market outcome" and claim that their "you can't argue with success" logic is stronger than what, for an example, Professor Carl Shapiro (Berkeley) told us about bargaining power and the normal splitting of gains from engaging in a transaction. But when some contract terms are so far out of the ordinary in business, something must have gone terribly wrong. Better late than never to fix the issue. Patently absurd: did you know Qualcomm charges a 5% wireless patent royalty on iPhone repairs? one of the best examples of hidden costs that we--the consumers--don't know about until they surface in litigation. But whether or not we know about them, we're the ones to foot the bill at the end of the day. Qualcomm wants a 5% patent royalty (with a $400 cap for the royalty base) on smartphones. 3.25% of that relates to standard-essential patents, though I haven't seen Qualcomm successfully enforce even one of those SEPs in all those years. The related dollar amount will be illusory the moment its wireless SEPs must be licensed at the chipset level. Another 1.75% relates to non-standard-essential patents, and after almost two years of non-SEP infringement litigaton against Apple, Qualcomm has no real leverage. News cycles aren't leverage. So there's a problem with what they charge, but until I read this pretrial brief, I was unaware of there being another problem with the wide net they cast when actually collecting their royalties. If Qualcomm held one or more patents on a machine used by Foxconn when repairing iPhones, and if the agreement between them and Foxconn was about revenue-sharing instead of a per-machine license fee, then it would be OK. There might be an argument then about whether those patents are valid or actually infringed, but at least the patents would be logically connected to a repair service. In this case, however, we're talking about wireless communications patents, general circuitry patents, and software patents. None of that justifies another patent license fee only because a broken device is repaired. If you repaired iPhones and an average patent troll tried to shake you down, arguing that you owe him a royalty on your income from repair services even though his patents are entirely unrelated to the activity of repairing those devices, you would decline to pay. If the troll insisted, you'd ask him which part of "no" he doesn't understand or, if all else fails, some might even flip him the bird. But you definitely wouldn't pay up! So how can Qualcomm get away with this (and some other things)? How can they impose such contract terms when they actually have a FRAND (fair, reasonable and non-discriminatory) licensing obligation with respect to their SEPs, meaning that all terms must be FRAND, not just one or two? They've clearly been extremely effective at leveraging their patents and their chipset business. As the example of a $1 royalty on a $20 iPhone repair shows, "extremely effective" is a euphemism for the situation. Qualcomm's leverage has created an absurd situations, and both the FTC lawsuit in San Jose and the San Diego action by Apple and its contract manufacturers are key parts of what's needed to fix the problem. It will presumably take more than those two cases, but in the short term those lawsuits are most likely to help--not just in the sense of helping those companies, but the industry at large, and consumers. There was a time when the high-end smartphone market was considered a "two-horse race" between Apple and Samsung. A duopoly is better than a monopoly, but I'm glad there's now a lot more competition in that segment. One company that has made and continues to make a particularly important competitive impact is China's Huawei. For my app development company, I've bought comparable numbers of phones and tablets from each of the three aforementioned device makers. It's an undeniable fact that the Chinese government's influence over local companies is huge, though there have also been stories of U.S. intelligence agencies requiring backdoors, and of countries like China being comfortable with U.S. software products such as Microsoft Windows only after they are at least given the opportunity to inspect source code. Huawei's CEO gave an exclusive interview to the BBC in which he addressed some of the controversies surrounding Huawei. It's worth listening to. For my part, I'm still unconvinced that the detention of Huawei's CFO was a good idea, and one of the things that make me skeptical is that it would have been easy for Huawei to engage in any concealed financial transactions with Iran through a place like Switzerland (rather than going via a U.S. bank, which appears too stupid to be true). As for security threats, the U.S. Ambassador to Germany, Richard Grenell (the best #MAGA diplomat imaginable! ), recently said, according to German media, that it's a threat to telecommunications networks when infrastructure vendors are under the control of foreign governments, and that's right, but what should the conclusion be? My recommendation is to take the same approach to China as Ronald Reagan did to the Soviets: "Trust, but verify." Note the important two-letter difference here between "verify" and "vilify!" Yesterday I reported on Huawei's settlement with MPEG LA following the enforcement of injunctive relief in Germany and supported a call by many industry players for proportionate patent remedies in Europe. The context in which I do take Huawei to task, no matter how much I admire and like that company, is the obligation to license standard-essential patents on FRAND terms. I like Samsung, too, and that didn't prevent me from calling for antitrust action against them many years back in a similar context. And while Apple hasn't sued anyone over a SEP yet (thus I haven't had the opportunity to remind them of their FRAND obligations), I lashed out at them when they described a $40 per-device damages claim over five software patents as a "reasonable royalty," given that "reasonable" is the "FR" part of "FRAND" (and the "ND" part wasn't put before the Apple v. Samsung jury because Judge Koh unfortunately didn't admit real-world license fees into the evidence). At the moment, however, Huawei is, to my great dismay, the only one of the top three device makers to behave in ways that call its commitment to FRAND into question. It appears to make supra-FRAND demands and to seek leverage through Chinese patent injunctions, a trade war-like issue that I believe is underreported to almost the same extent that other Huawei issues are overstated. In Judge Orrick's opinion, the constitutional right to a jury trial is so fundamental to the U.S. legal system that a separate bench trial (trial before only the judge, without a jury) for Samsung's FRAND breach claim would only have been warranted if there hadn't been any basis whatsoever for a jury trial. Here, however, Judge Orrick found that even if one limited Samsung's FRAND breach damages claim to a recovery of the costs related to expert witnesses, it would (in my words) be better than nothing and still stufficient to justify a jury demand. For the most part, the September trial will be about patent infringement allegations. But based on Judge Orrick's decision, the jury will also hear what Samsung has to say about Huawei's overall conduct. While infringement and validity are issues that have nothing to do with a patent holder's behavior, there is a risk to Huawei that jurors will view Samsung as the "good guys" and Huawei as the "bad guys." Huawei's royalty expert, Michael Lasinski, also testified for the FTC against Qualcomm last month, and an attorney representing Qualcomm basically destroyed him. Samsung doesn't need or ask for my advice, but if I were them, I'd try to bring in the same Cravath lawyer (unless that firm is precluded from doing work for Samsung) just for the FRAND economics part. The outcome of the cross-examination might be the same again. Cravath and Quinn Emanuel (Samsung's counsel in the Huawei case) are already working together against Apple, so they might as well against Huawei. The most problematic part of the proposed EU Directive on Copyright in the Single Market may be deleted tomorrow! Update! #CopyrightDirective ohne #Uploadfilter ist möglich. An @katarinabarley wirs es nicht scheitern! Sie versucht gerade @HBraun, @peteraltmaier & #Merkel davon zu überzeugen, Richtlinie ohne #Artikel13 auf den Weg zu bringen. Hoffe, @CDU hat Ernst der Lage erkannt. "Update! #CopyrightDirective without #UploadFilter is a possibility. It won't be @katarinabarley's fault! She's presently trying to persuade @HBraun, @peteraltmaier and #Merkel to adopt the directive without #Article13. I hope @CDU [= Merkel's party] has understood how serious the situation is." Mr. Woelken gave a great speech at today's JURI (Legal Affairs Committee of the European Parliament) debate. I particularly liked the fact that he emphasized, toward the end, the importance of user-generated content. That's what Article 13 is about; not "censorship." About an hour before the tweet shown above, he encouraged the resistance movement to keep on fighting and said "you're being listened to." That may already have been based on some early indications of all the protests having an effect on the German government. those Member States must also represent more than 65% of the total EU population (so any number of countries can block provided that they account for more than 35% of the EU's population). Only if there is no blocking minority in place, a bill is adopted, so there are two bites at the apple: either get 13 countries or get fewer countries as long as they account for more than 35% of the total EU population. In the context of the EU Copyright Directive, a blocking minority based on the second criterion would be in place if the countries that previously opposed the bill hadn't changed their position (and there's no reason why they should) and Germany joined them: in that case the opposing countries would represent more than 35% of the total EU population. In fact, the total population size of Poland, Italy, Luxemburg, Malta, Slovakia, the Netherlands, Finland, Sweden and Germany would be approximately 43%. They could threaten to vote against unless Article 13 is thrown out. That's how it often works in the Council. The coalition agreement between Merkel's party (CDU), its small regional sister party (CSU) and the SPD contains a clause according to which Germany would not support upload filters. Well over one million of the 4.7 million signatures delivered to Minister Barley today were from German citizens--mostly young people, including countless first-time voters. The SPD has recently experienced some recovery in the polls after making some political demands appealing to its traditional voter base. The EU Copyright Directive is now about young voters, and if Merkel did what she indicated in a speech today and supported upload filters, her party would take all the blame, with significant potential consequences in a crucial election year (European Parliament elections plus various regional elections in Germany, particularly in the East, where Merkel is from but most unpopular). Obviously, can't comment on this. But this suggests that they, too, have an inside track. In my experience, information often leaks from those diplomatic circles. COREPER, the committee of permanent representatives (= the Members States' ambassadors to the EU), doesn't meet in public, but there's always a number of people in Brussels who know where the other Member States stand. That's the idea of having permanent representatives in Brussels: they constantly communicate regarding these processes. Tomorrow (Wednesday), there'll be a COREPER vote unless the latest developments result in a postponement, which would be more than just a crack in the shell for the directive. COREPER votes aren't final: the decisive votes have to be cast by the heads of state and government at a European Council meeting, or by ministers (or the state secretaries representing them) at an EU Council of Ministers meeting. But COREPER votes are meant to prepare the formal votes, and as long as a bill doesn't have a qualified COREPER majority, there's normally no point in putting it to a vote in a formal Council meeting (absent some new backroom agreement between countries that would change everything, but even then they'd normally hold another COREPER vote first). Should the bill fail to get a qualified majority (= a majority so solid that there's no blocking minority of any kind) in the Council, the European Parliament's JURI committee will probably have to postpone its own vote (scheduled for next Tuesday, and meant to prepare a plenary vote in late March). If the Council does adopt the bill, but without Article 13, JURI could speak out in favor of the Council's new version. It would be irrational for JURI not to do so: no other article in the bill depends on Article 13. Theoretically, the EU could later try to amend the directive to the effect of reintroducing Article 13. However, the next European Parliament will be structurally different from the current one, with more anti-establishment MEPs than ever. In today's JURI debate, Axel Voss MEP, the German conservative (note that politicians from Merkel's party aren't conservative by American standards) who's the Parliament's rapporteur and the leading proponent of this directive, said that Article 13 was merely consistent with the case law. If that were so (it obviously isn't, but that's what he says anyway), Mr. Voss shouldn't have a problem with just dropping it in order to have a deal and proceed. Mr. Voss's speech today was in parts just as absurd as Article 13 itself. For an example, he argued that most online platforms wouldn't be affected because they don't provide large quantities of copyrighted content. However, even private photos uploaded to social networks as profile pictures are copyrighted, so Article 13 casts a wider net than Mr. Voss would have you believe. It was really disappointing to see Tadeusz Zwiefka MEP, a Polish center-right politician with a communist past, support the directive in today's JURI debate. He was among the MEPs who strongly opposed software patents in 2004-2005. All going well, Article 13's days are numbered. Not only its days. Even its hours. Qualcomm's enforcement of a likely invalid and most likely not infringed patent against Apple in Germany is a Pyrrhic victory that generates limited incremental chip sales but exacerbates its antitrust problems (instead of forcing Apple into a global settlement). But in another case, two German patent injunctions have brought about the desired result: MPEG LA, a patent pool company, "announced today that Huawei Technologies Co., Ltd., Huawei Device Co., Ltd and Huawei Device (Shenzhen) Co., Ltd ('Huawei') have become Licensees to MPEG LA's AVC Patent Portfolio License ('AVC License'). As a result of this agreement, all legal disputes related to patent enforcement actions brought by patent holders in MPEG LA's AVC License against Huawei have been resolved." In November, MPEG LA announced that the Dusseldorf Regional Court ("Landgericht Düsseldorf" in Geman) ruled that Huawei and ZTE infringed patents of two contributors to its pool. In late December, MPEG LA announced that the Dusseldorf Higher Regional Court ("Oberlandesgericht Düsseldorf") denied Huawei's and ZTE's motions to stay the enforcement of injunctions over EP1773067 in Huawei's case and EP1750451 in ZTE's case. Both patents were filed for by Panasonic. But MPEG LA may have litigated over other patents as well (which would explain why they claimed that patents belonging to two pool contributors were enforced). Presumably, ZTE will also settle in the near term. German injunctions can give a patent holder significant leverage, provided that they can't just be worked around. MPEG LA appears to have a perfect litigation track record in Germany: whenever they sued someone there, MPEG LA prevailed on one or more patents. An MPEG LA press release states that "[a] team led by Axel Verhauwen of Krieger Mes & Graf v. der Groeben and Gottfried Schüll of Cohausz & Florack represented the plaintiffs." To the best of my knowledge, Mr. Verhauwen has represented MPEG LA in either all or at least the vast majority of its German lawsuits over the years. It's unclear why Huawei and ZTE didn't just take a license, given that the cost of defending against a few patent infringement cases typically exceeds that of the annual royalty cap. It could be (and this is pure speculation) that those companies take issue with some non-monetary terms, such as a grant-back obligation. In early December, 34 organizations signed an open letter calling for the application of the proportionality principle to patent infringement remedies in Europe. The list includes industry organizations such as CCIA and ip2innovate, major technology companies such as Samsung, Microsoft, SAP, Intel, HP, and Cisco, and automotive companies such as Volkswagen, Daimler, BMW, and Honda. What makes Germany a particular hotbed for patent infringement lawsuits is the combination of speed, the enforcement gap (because it takes longer to invalidate a patent that should never have been granted than to obtain an infringement ruling) and, above all, access to injunctive relief as a legal remedy (as opposed to an equitable remedy involving an eBay-like analysis). In many cases, litigation watchers like me just have to look at the patent claims-in-suit to figure out that a plaintiff like BlackBerry (currently suing Facebook and its WhatsApp and Instagram subsidiaries) is simply playing the lottery with patents of dubious validity (software patents...), just because the grand prize is a Germany-wide injunction. While I do agree with the above-mentioned open letter, the situation is more likely to get worse than to get better anytime soon.